things on the advice of Alton Brown, but believe me, this is worth it! ): Vacu Vin Pineapple Slicer. 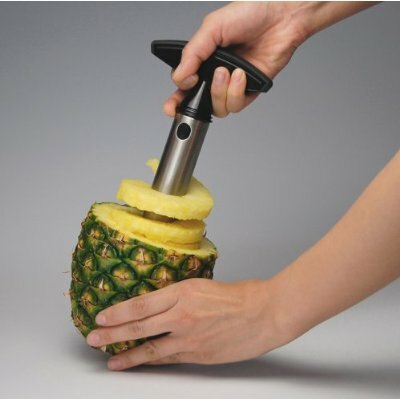 You slice the top of a pineapple and then this nifty gadget slices it up in less than a minute. Product endorsement aside, I’m really writing about pineapple because I found an easy and delicious recipe for homemade pineapple vodka. Strain the pineapple out and you’re left with homemade pineapple vodka! Store it in the refrigerator for up to 2 weeks. You can still taste the alcohol a little, but there is a strong pineapple flavor too. Think of the cocktail possibilities! Try mixing it into any tropical cocktail, combine it with orange juice, or try it straight up and chilled if you like martinis. 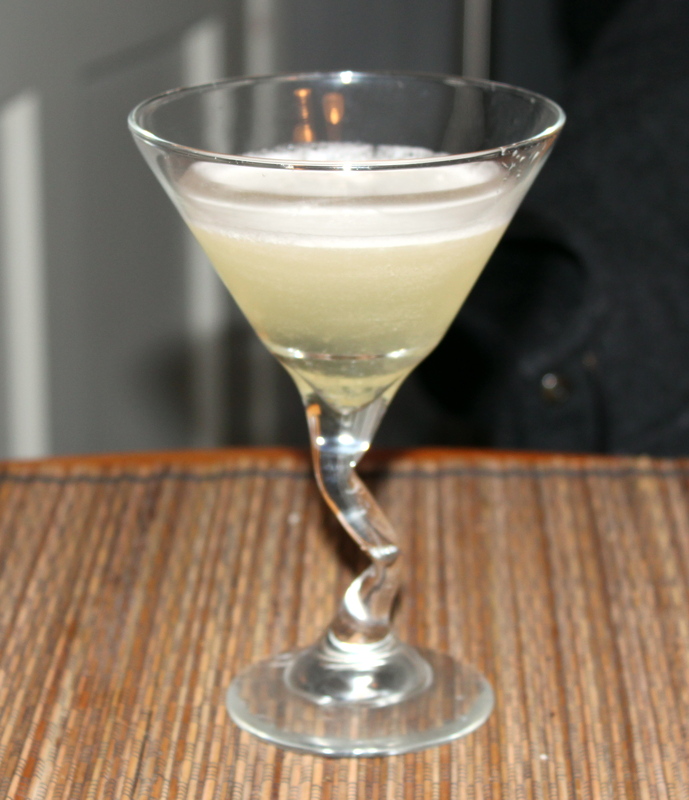 Pictured at right is a citrus martini – pineapple vodka mixed with triple sec, lemon juice and simple syrup. A nice way to bring a little sunshine into the dreary gray winter. Enjoy! Doh! I got a can of pineapple to make Peeps ambrosia and then I re-read this. There are green pineapples in all the stores now. I guess I could get one and make it again! Also Annie has a funny story now about pineapples. She is nannying part-time in this really yuppie part of San Francisco (that would be Noe Valley) and this woman in the park was going on and on about how they get fresh pineapple for their kid and let it ripen and blah blah blah, and her mother who was clearly not from around here was all, “Canned pineapple is good too!” and all the other ladies were HORRIFIED. And she was all, “Carl likes it in his smoothies!” and they were EVEN MORE HORRIFIED. Like she had said they should feed their children Republican rat poison smoothies. Made from poop. Ha! Canned pineapple really doesn’t taste as good as fresh, but I certainly wouldn’t be horrified if someone served it to a small child. 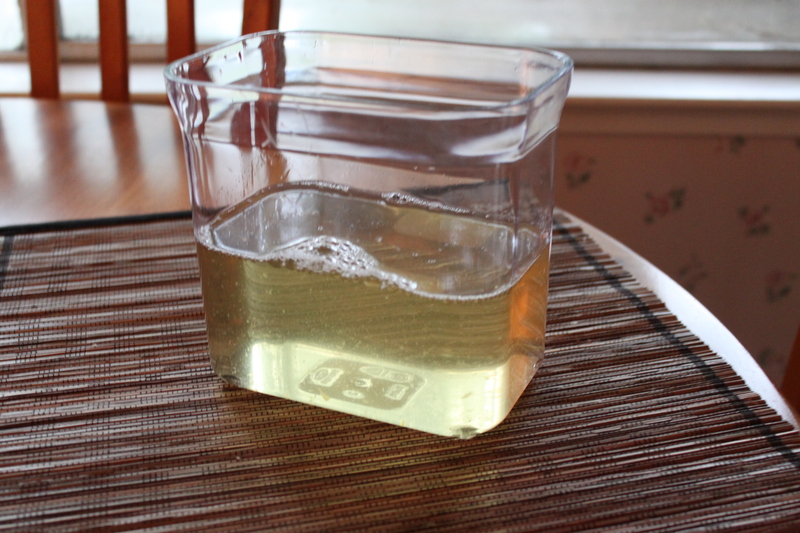 Although, for this vodka recipe, you really should use fresh. Uh oh, I may be turning into one of them! P.S. Was Russ a bartender? Sort of. He was a drink runner at a bar in a restaurant a long time ago and basically knows how to make most drinks. OK it’s not a pain to cut a Pineapple. First you cut into quarters lengthwise and then just skim your knife along the bottom like you do a watermelon. GEEZ. What’s rough about that. You have juice in the skin so squeeze it before you toss it. You don’t get stickers, you get a few seeds. You don’t have to cut off the center of the pineapple. It’s not that rough to eat, it’s actually really good. I have Hawaiian’s in my family so trust me on this. When you pick a Pineapple, it’s good to get one that looks a bit old because those are the sweetest Pineapples. Ready to use right away though. You can tell a ripe Pineapple by pulling at the leaf at the top and if it comes out smoothly with no problem, it’s ready to go. Plus if you smell the bottom you will catch that sweet smell. Don’t be afraid to get one that looks a bit old though. Those are usually the best to use if you plan on using Pineapple soon. And you can freeze Pineapple no problem. Just add a bit of it’s juice. I just wanted to help you a bit here.